The ability to predict the effectiveness of a particular cancer therapy regimen on individuals early enables us to design alternative therapies without losing valuable time. For individualized optimal therapy, one needs to understand the metabolic origin of inter-subject variations to therapies observed in the clinic. Using a preclinical animal model, we can study therapy mechanism from a metabolic point of view, and investigate new therapeutic drugs and interventions. In addition, we can explore new physiological and metabolic parameters (e.g. vessel leakiness, glucose metabolism) available through exogenous contrast agents. In principle, fluorescence signals can provide greater detection sensitivity and specificity compared to absorption signals, thus enabling diffuse optics to improve cancer detection and diagnosis as well as therapy monitoring applications. 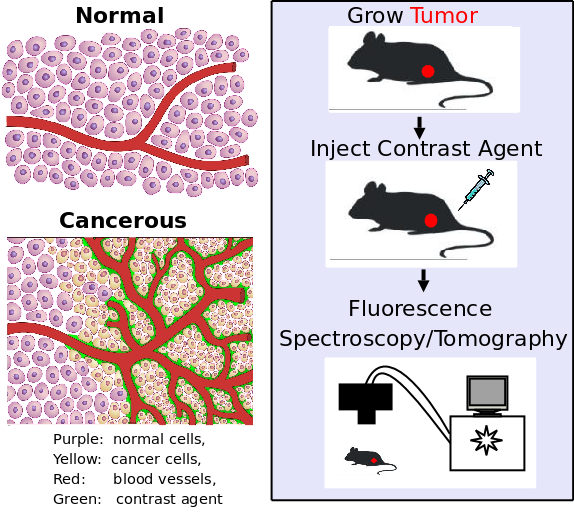 In order to achieve preclinical testing of dyes and therapies, we develop and refine optical spectroscopy and imaging systems to quantify endogenous and exogenous tumor contrasts in small animals. The instruments are designed to provide multi-spectral information essential for quantifying multiple endogenous parameters (e.g. hemoglobin, water, lipid concentrations) as well as fluorescence detection of signals from cancer targeting exogenous contrast agents. Through model-based image reconstruction, pharmacokinetics and biodistribution of new optical agents are quantified. Findings from these tests could be utilized to examine the feasibility for applications to humans. A microscopic schematic illustrating contrast agent accumulation in cancer due to leakiness of blood vessels (Left); Preclinical animal model for evaluation of new optical contrast agents and cancer therapies (Right).